Looking for a simple, easy veggie burger recipe that you can pull together with some basic ingredients? 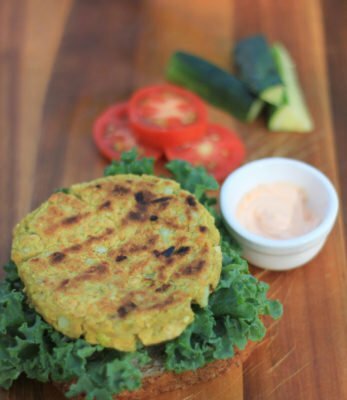 Look no further, and give this Chickpea Veggie Patty recipe a try! You might even already have all the ingredients in your fridge and pantry. What I love most about these patties is that the garam masala complements the potatoes and chickpeas, as well as the sweet onion. These patties would pair well on a burger bun with some lettuce, tomato and a little spicy vegan mayo. If you are looking for some fresh meal prep ideas, why not whip up a batch of these patties to crumble into a salad, add to a wrap, or enjoy in a sandwich? What Angela Tucker loves most about these Chickpea Veggie Patties is how the garam masala complements the potatoes and chickpeas, as well as the sweet onion. These patties pair well on a burger bun with some lettuce, tomato and a little spicy vegan mayo. Warm up a pan (cast iron works great) to medium heat on the stove. Add oil, then add the onion and garlic. Once onion and garlic are soft and fragrant, add in the garam masala, turmeric, and curry powder to warm the spices. If you are using a food processor, add the chickpeas to it and pulse to chop them coarsely (you don’t want to puree them). If you don’t have a food processor, you can use a large spoon to press the chickpeas against the side of a bowl to mash them slightly. Transfer the mashed chickpeas to a large bowl, then add the cooked potatoes, spiced onion and garlic mixture, breadcrumbs, salt and pepper to the bowl. Mix everything together. Add a little oil back into the pan used to cook the onion and garlic and heat to medium heat again. Form the patties (around 3” in diameter and ½” thick). The mixture might be a little sticky, so moisten your hands between patties if needed. Place the formed patties into the heat pan and cook each side until browned (around 10 minutes each side).